PULLMAN, Wash. – The growing organic produce industry may soon have a new way to ensure the safety of fresh fruits. Scientists at Washington State University have shown that ultraviolet C (UVC) light is effective against foodborne pathogens on the surface of certain fruits. The study was published in the International Journal of Food Microbiology. The findings are expected to be welcome news for organic fruit processors who seek alternatives to chemical sanitizers and must also comply with the U.S. Food Safety Modernization Act to help prevent food borne illnesses. After learning from organic farmers and food processors about a lack of sanitizing options, WSU food safety specialist Shyam Sablani and his colleagues looked into alternatives and decided to explore UVC light. It has a shorter wavelength than ultraviolet A or B light. UVC light, which cannot penetrate opaque, solid objects, can be effective in sanitizing surfaces. The technology, which has been around for several years, has been used to effectively sanitize food contact surfaces as well as drinking water and contaminated air. It works on microorganisms by destroying nucleic acid and disrupting their DNA. But the light didn’t affect the chemical or physical quality of the fruit in the study. Sablani and his colleagues exposed apples, pears, strawberries, raspberries and cantaloupe to different doses of UVC to determine how effective the pathogen-killing light was against a mix of strains of E. coli and listeria. 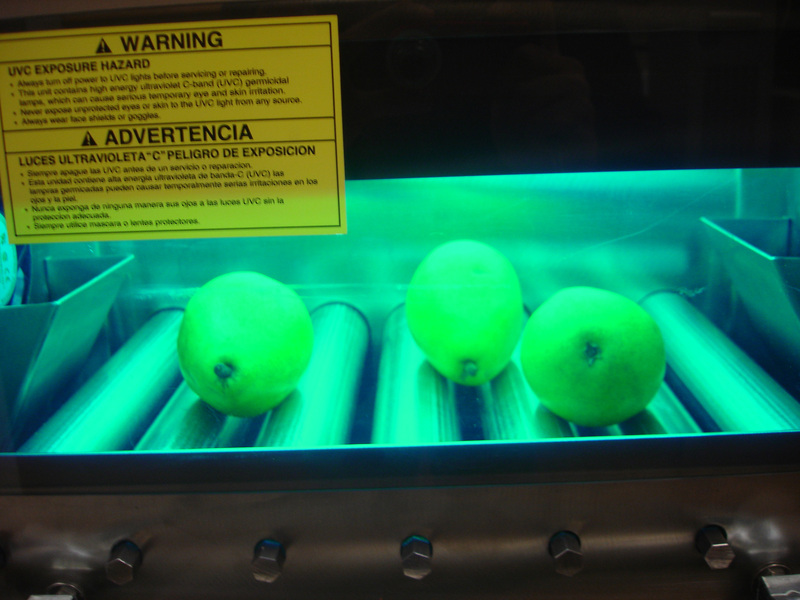 They found that the light can inactivate up to 99.9 percent of pathogens on apples and pears. However, listeria was more UVC resistant than E. coli. The UVC light inactivated 90 percent of pathogens present on rough-surfaced fruit. “For food safety standards, you don’t want any pathogens on the fruit,” Sablani said. Rough surfaces of strawberries, raspberries and cantaloupe offer places where pathogens can literally hide, reducing the effects of UVC light. If bacterial contamination levels are high, then UVC technology alone may not be sufficient to achieve the desired level of effectiveness. Sablani said research is underway to increase the effectiveness of UVC light on fruits with rough surfaces. “Interest in this technology is high because it’s simple to implement and inexpensive,” he said. Adding UVC lamps to a fruit packing line does not require major modification. UVC lamps enclosed behind protective barriers can be easily set up in a tunnel that exposes fruit to the light as it passes on a conveyor belt. The study was partially funded by a grant from the Biological and Organic Agriculture (BIOAg) program of the WSU Center for Sustaining Agriculture and Natural Resources.